Updated on Dec. 26, then on Dec. 28 to reflect postponement of Sunday's congregational cleanup: At noon on Dec. 26, Rabbi Donald Kunstadt was walking around the property of Springhill Avenue Temple in mid-town Mobile, looking at the damage a tornado had caused the previous evening. The F-2 twister hit at 5 p.m., right at sunset. Had it been any other Tuesday instead of Christmas, rush-hour would have been in full swing; instead the roads and the Temple were quiet. The tornado, unusual for a city more accustomed to hurricanes, cut a swath over several blocks, damaging Mobile Infirmary and Murphy High School. The Reform Temple is on a direct line between the two. Kunstadt pointed out that the large number of tree limbs littering the yard -- and being cut smaller and removed by a dozen workers -- came from the 200-year-old oak trees that grace the yard. None, however, hit the building, though one tree blocked the western driveway no more than 10 feet in front of the building. Much of the copper flashing from the roof had been blown off, including a 20-foot section that had wrapped around a nearby power line like a tallis. Unike a nearby historic Episcopal church, the roof was still on the building and its condition was being assessed -- but Kunstadt said the roof would likely be the biggest challenge. It looked like the roof had been picked up slightly and settled back into place. In one of the main interior corridors, he pointed to a hole in the ceiling where a beam had been propelled by the tornado "like a missile" and driven through the roof. In just about every other classroom, a window or two had been blown out, scattering glass and papers, and bringing leaves inside. 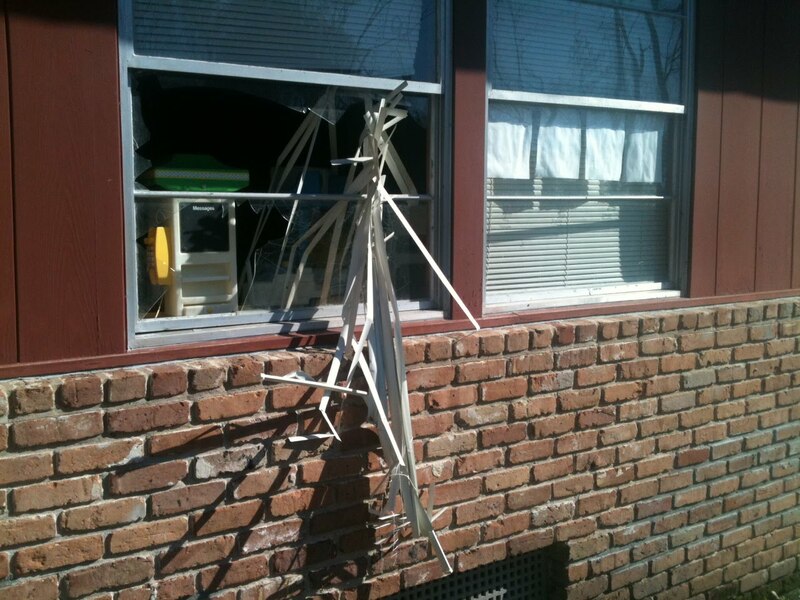 Two windows in the large Kindergarten room were blown out, but throughout the building there was little evidence of water getting inside. One of the large windows in the social hall was completely dislodged, but all of the stained glass windows in the sanctuary were intact. Kunstadt said the congregation had installed plexiglass covers that can withstand 150-mile winds, though they did so with an eye toward hurricanes. The F-2 tornado had winds estimated at 110 miles per hour. The sanctuary and chapel were untouched. On the western side of the building, a section of exterior brick had been peeled off from the building. Outside, a wood fence between the Temple and nearby houses was blown down, but the congregation's vegetable garden was intact, with collard greens ready for New Year's Day. Some of the houses lost sections of their roofs, so the Temple was relatively lucky by comparison. Power and phones were out, and the air conditioning units were also damaged and disconnected. "Our historic Temple has faced many challenges through the years," Kunstadt said, and the congregation's leadership was already working on recovery. He was planning to remove the Torahs for safekeeping, though by nightfall the building had been secured. Ahavas Chesed, the community's Conservative congregation, will host Springhill Avenue Temple this Shabbat for a 6 p.m. joint service. There will be no service at Springhill Avenue. 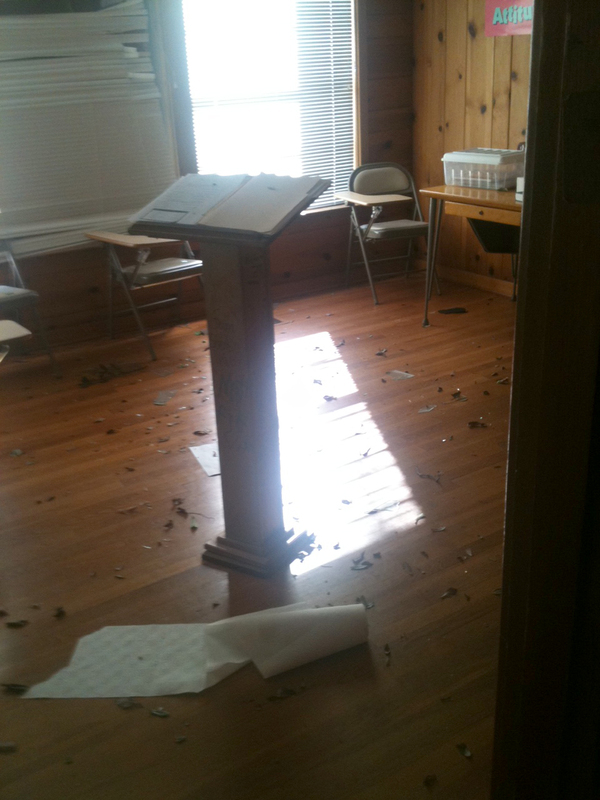 A Temple cleanup was announced for Sunday, but on Thursday afternoon the congregational leadership postponed it, citing possible unseen hazards on the property. The Union for Reform Judaism told SJL that they would be getting in touch with the Mobile congregation to see how they could help. 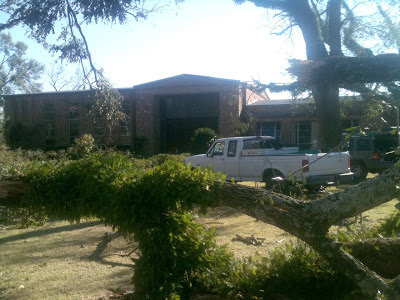 Another smaller tornado hit Mobile last week, causing damage on Springhill Avenue about a mile west of the Temple, and on Airport Boulevard to the east of Ahavas Chesed. Some Temple members were at Mobile Infirmary when the Dec. 25 storm struck, finishing the last shift of the annual Pinchhitters Program, where Temple members volunteer at area hospitals so non-specialized employees can have Christmas day off.